RAPCO Inc. manufactures quality FAA-PMA approved pneumatic systems components. 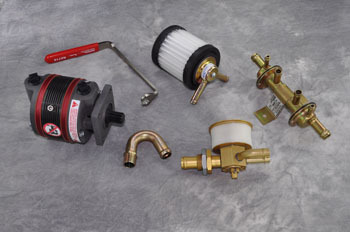 The product line includes dry air pumps, filters, regulators, manifold check valves, fittings, shear couplers, and complete vacuum system kits. In many cases RAPCO’S FAA approved repair station C.R.S. # NE5R064N, offers an overhaul option. Since 1981 RAPCO has strived to produce high quality products and is committed to its customer’s satisfaction. Malfunction of a dry air pump or other pneumatic system components while flying in Instrument Meteorological Conditions (IMC), or at night without visual reference to the horizon and ground, can cause spatial disorientation and or loss of control. This can result in death, bodily injury, or property damage. Aircrafts operating in these conditions must have a functional standby pneumatic source installed or a backup electric attitude gyro instrument. The pilot must be familiar with standby operations and have tested its function prior to entering IMC or night conditions. An annunciator light to warn of system failure is also recommended. If a pneumatic system has failed it must be repaired before conducting any future flights in IMC or night conditions. Installation of components or repairs of a pneumatic system must be functionally tested before the aircraft is operated in Instrument Meteorological Conditions (IMC), or at night without visual reference to the horizon and ground.